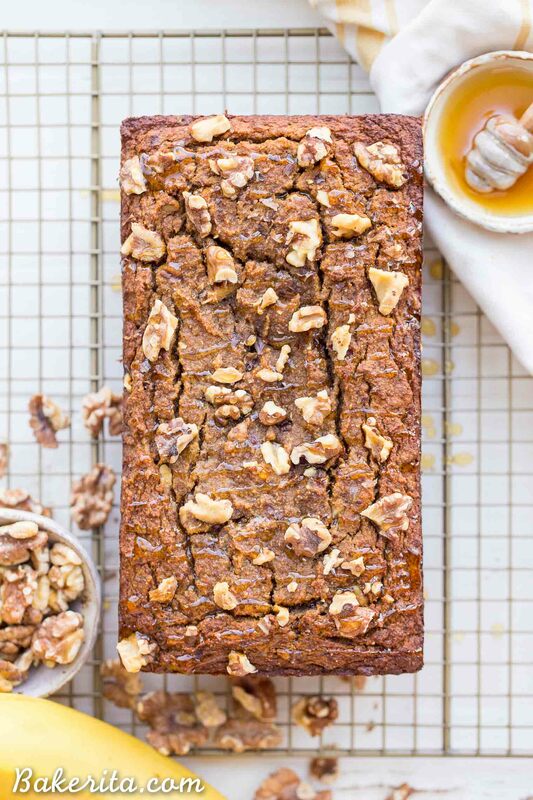 This Paleo Honey Nut Banana Bread is a deliciously healthy breakfast or snack that will help keep you satiated for hours. It’s a lightly honey-sweetened treat that’s gluten-free and grain-free and packed with crunchy walnuts. This post is sponsored by Wholesome. Honey is all the buzz right now ;) especially at the beginning of the New Year when we’re all trying to avoid too many refined sugars after too much holiday indulgence! I know I had a few too many gluten-free cookies these past few weeks. 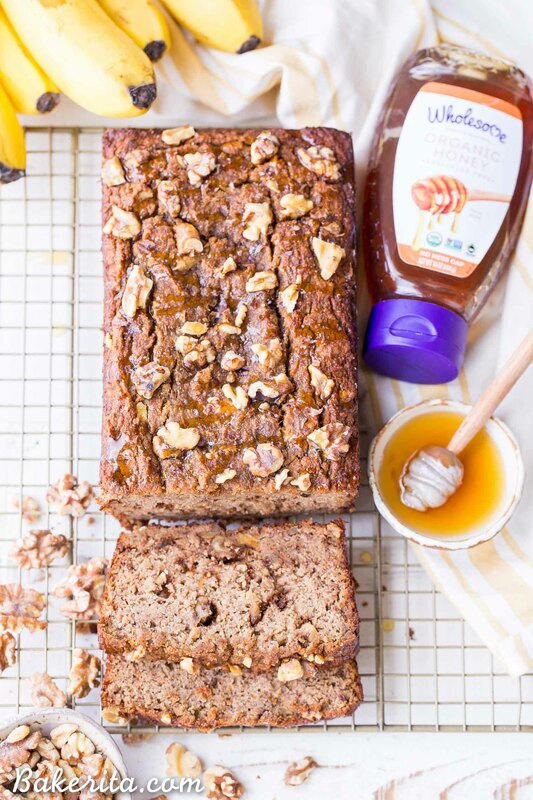 This paleo honey nut banana bread is one of my newest faves, and I was eating slices of it all day on Christmas to keep myself from eating ALL the cookies and giving myself a major stomach ache. It’s fluffy and filling and full of banana and honey flavor, with the delicious crunch from the toasted walnuts. Swoon! I sweetened the banana bread with just a quarter cup of Wholesome Organic Honey, which I found in the baking aisle at my local grocer. It really doesn’t need any more than that, since the bananas already add so much natural sweetness of their own! Wholesome‘s organic honey comes from protected hives in the remote forests of Brazil – this helps ensure it’s USDA certified organic, which is hard to ensure with local honey since only 1% of US farmland is organic. It’s also pesticide free, fair trade certified and non-GMO! It has such a deliciously sweet flavor that works perfectly in this recipe. Wholesome also makes delicious raw unfiltered organic honey (coupon here! ), but I prefer using that in recipes that don’t require baking to maintain the nutrients…or just drizzling it all over recipes like this! 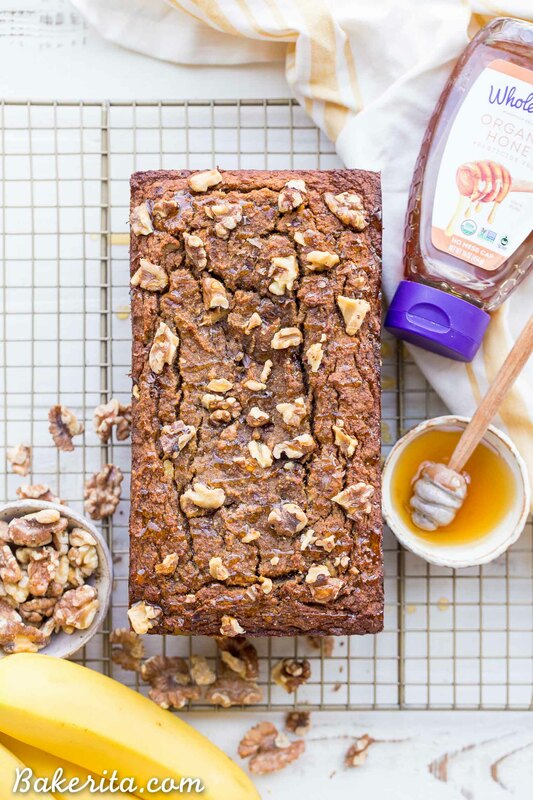 You can also find more delicious inspiration on using Wholesome Organic Honey products on their recipe page. I used coconut flour in this honey nut banana bread because I find the texture helps absorb any excess moisture from the bananas and honey. Since coconut flour is so uniquely absorbent, I wouldn’t recommend subbing in any other flours in place of it – it just won’t work quite the same way! The recipe also uses smooth almond butter, which helps provide some structure and fat, while also making the loaf super rich and flavorful. You can definitely sub in another nut butter of your choice for the almond butter, though. 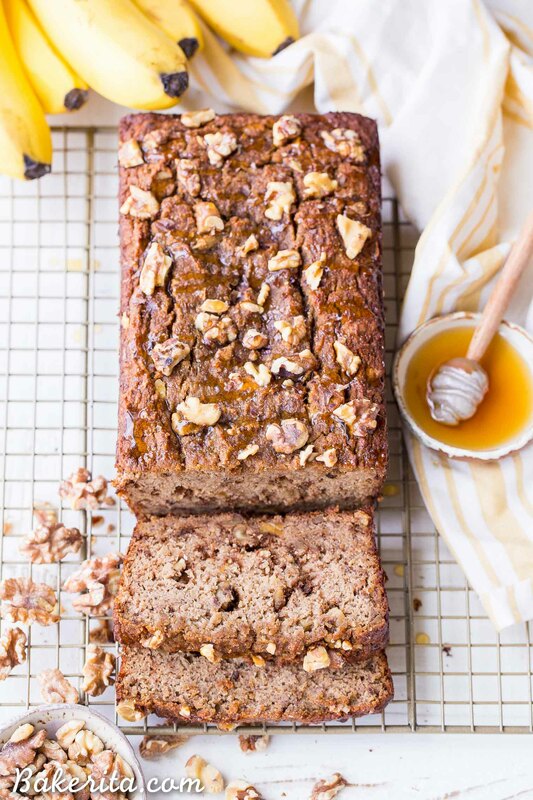 Make a loaf of this Paleo Honey Nut Banana Bread, slice it up, and store in your fridge or freezer. Trust me, you’ll be SO HAPPY to have a fluffy, flavorful, lightly-sweetened slice of banana bread at the ready whenever the craving hits (which it will). Enjoy!! 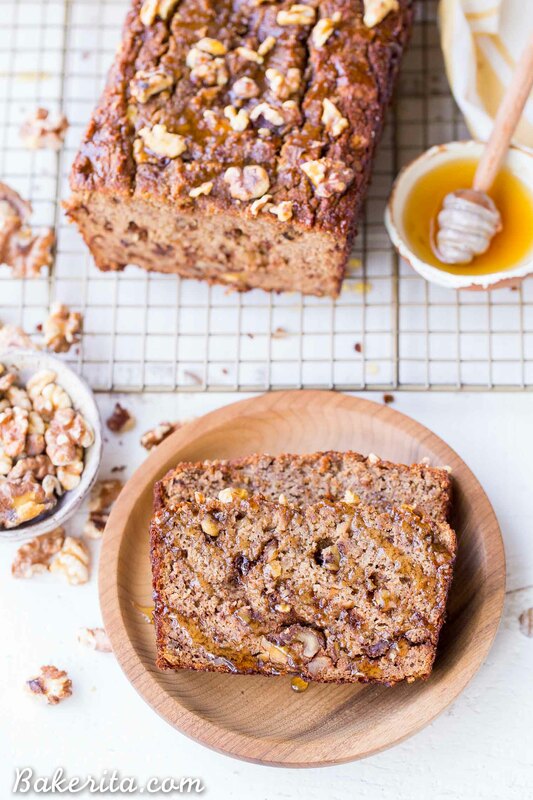 This Paleo Honey Nut Banana Bread is a deliciously healthy breakfast or snack that will help keep you satiated for hours. It's a lightly honey-sweetened treat that's gluten-free and grain-free and packed with crunchy walnuts. Grease one 9"x5" loaf pan (you can also use an 8"x8" square pan) and preheat the oven to 350ºF. In a large bowl or mixer, combine the mashed bananas, eggs, honey, coconut oil, vanilla extract and nut butter until fully combined. Add the coconut flour, cinnamon, baking soda, baking powder, and sea salt to the wet ingredients and mix well. Fold in the chopped walnuts. Bake in the preheated oven for about 40 minutes if using a square pan, and 50-60 if using a loaf pan. A toothpick inserted into the center should come out clean and the loaf should spring back if you poke it lightly with your finger, not leave an indent. Remove from oven and allow to cool on a wire rack for about 1/2 hour. Flip out onto a cooling rack to finish cooling completely. Store tightly wrapped in the refrigerator for up to 5 days, or in the freezer for up to 3 months. This post has been sponsored by Wholesome. As always, all thoughts and opinions are my own. Thanks for supporting the brands that support Bakerita! I love your Paleo recipes. Keep them coming. Hi Shinal, I’ve only tested this recipe with coconut flour and it’s uniquely absorbent so I wouldn’t recommend using anything else. You would need to add about 3x the amount of another flour to replace it. I used ten grain flour and it worked perfectly well. By thecway I could not find a breakdown on the nutritional components for a single slice. Would you mind posting? I’ve baled this recipe at least 7 times and it’s a favorite! Hi Patty, so glad you’re enjoying it and that it worked well with that flour. I’ve just updated the recipe to include nutritional facts, though note that any changes you made will also result in some changes to the nutritional info. I just made this for brunch using some walnut butter I found abandoned in the back of the cupboard. So good! Only one slice left, all the kids ate it up. Thanks for the great recipe. So thrilled you and the family are loving it. Thanks for your feedback, and enjoy! 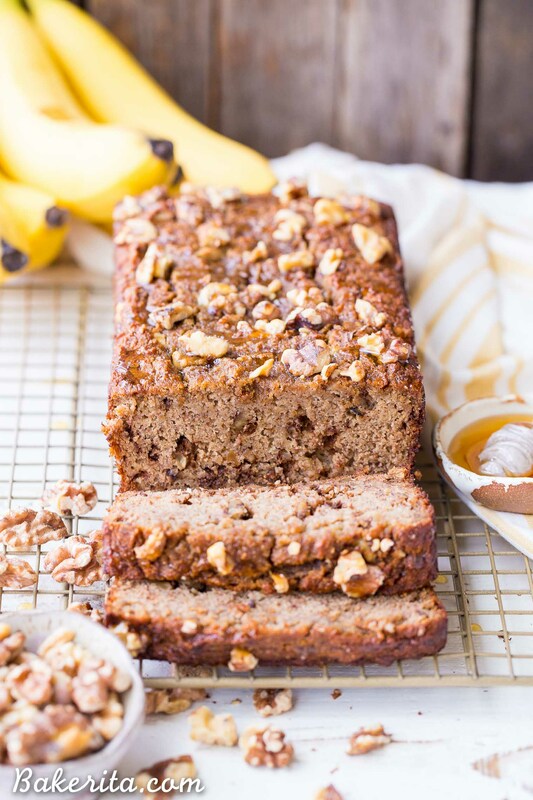 A delicious banana bread, and good for you too! Thanks for all your great recipes, I always enjoy making them! So glad you’re enjoying it! Thanks Rita. Would one be a able to subsitute the eggs for flax eggs? 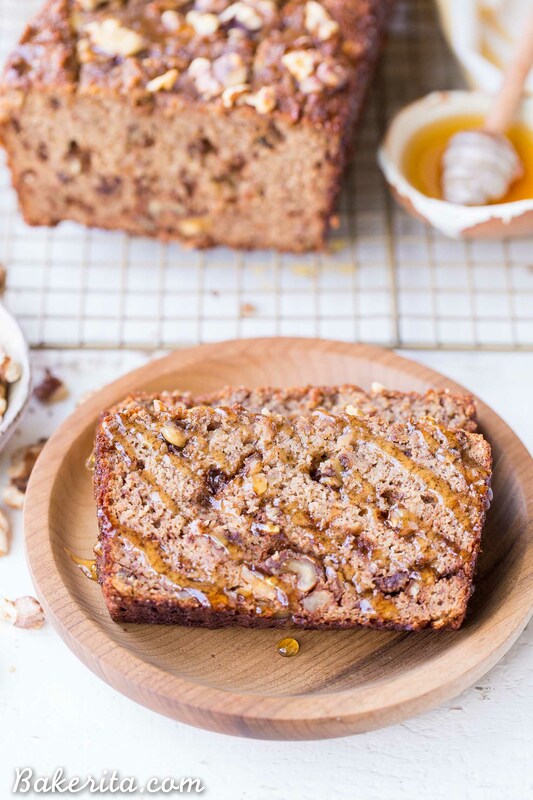 Or have a banana bread recipe that is vegan gluten free and paleo ?! I love your recipes. I am able to make so many of your desserts since having so many food restrictions, and they are delicious! thank you for your knowledge in baking ! Hi Jaymilyn, I haven’t specifically tried this recipe with flax eggs so I’m not sure. I’ve been working on a vegan/paleo banana bread, but it’s not perfect yet. Hopefully, I’ll have a recipe for that soon. I’d love to hear how it turns out with the flax eggs if you try it, though! I’m so happy to hear you and your family have been enjoying this recipe! Thanks so much for your feedback :) so thrilled you’re loving the banana bread and the thumbprint cookies. Enjoy! Hi Ange, coconut flour is very unique in that it is SUPER absorbent – usually about 3x more absorbent than other flours. I wouldn’t recommend using almond meal here, since you’d have to use a lot more of it and it’s not as fine as coconut flour is, so the texture would be very different. Hello! I’ve tried this recipe twice and it’s pretty delicious. However, there is some bitter after taste to it. I tried using less cinnamon but I I guess it’s not the culprit. Any advice? Thank you! Hi Lina, sometimes if your walnuts are a little old, they can taste rancid & bitter. Could that be the culprit?